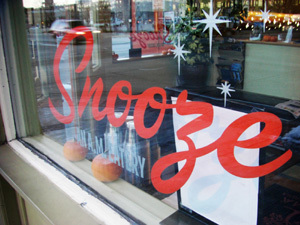 Since we established Snooze in the heart of the 5 points/Arapahoe Square and the Ballpark Neighborhoods, Snooze has worked to support and help Denver’s homeless community. We have embraced this endeavor by hiring and providing employment, sitting on the board of the Denver Homeless Commission, fundraising, creating a mentoring program through Urban Peak, volunteering and spreading awareness to support the homeless. When the Urban Camping Ban proposal was presented to us, we believed the Ban would provide and allow for more services and support in the form of shelters, mental health and general assistance for our area homeless. We believe that the Urban Camping Ban has not provided these opportunities and should be repealed or amended to more effectively meet the needs of our homeless community. As always, our goal at Snooze is to support and assist any endeavor that strives to improve and better the lives of our homeless community. To that end, we believe that the Urban Camping Ban has not met the needs of Denver’s homeless community and we respectively ask the city of Denver as well as the business community at large to work towards repeal or modification of the Urban Camping Ban and work towards an effective solution for Denver’s business and homeless communities. 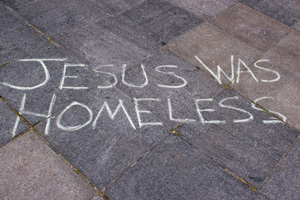 Survey finds law criminalizes activities necessary for homeless survival without providing alternatives. 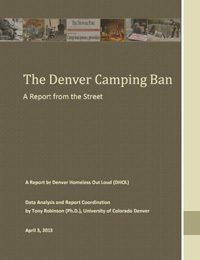 DENVER – Denver’s controversial “camping ban” has left the homeless no place to sleep outdoors safely and legally at night, forcing them into hidden spots or to seek indoor options that don’t exist, according to a report written by a University of Colorado Denver political science professor. Denver Homeless Out Loud presentation to the Denver Commission on Homelessness on April 2, 2013. The presenter is Dr. Tony Robinson, professor of political science at the University of Colorado Denver. Councilwoman Susan Shepherd (District 1) and Councilman Paul López (District 3) speak at the Denver Homeless Out Loud report release event on April 3, 2013. The homeless community speaks at the Denver Homeless Out Loud report release event on April 3, 2013. Rachel Pater speaks about LGBTQ homeless youth and other marginalized communities at the Denver Homeless Out Loud report release event on April 3, 2013. Pater discusses systems of privilege in politics that leave the most vulnerable behind.